Getting solar panels on your roof is very likely a good long-term investment, but there are a lot of little things to consider to make sure you get the best possible system. Solar Makes Financial Sense – You should probably do it. The average payback period for a residential solar installation in California is nine years (looking at 2011 data; solar prices have decreased significantly since then, so it is probably even shorter today). After the system is paid off, you are basically making money every month. Over 25 years, the return on investment for a solar system beats the average return of the S&P 500 (9.9%) in many areas. In California, the average ROI is 12%. That is a fantastic return, and it is basically risk free. Honestly, I can’t think of a better investment. Most solar companies give you the option to buy or lease your solar PV system. Both options will most likely save you money, but purchasing your system is almost certainly the better long-term value. Leasing your system will allow you to save money immediately with no upfront cost, but your installer will basically be pocketing a portion of your savings. There can also be complications if you decide to sell your house before the ~25 year solar lease is up. We chose to purchase our system outright, and that is the option I recommend for most people. If you don’t have the cash on hand, financing is usually available at reasonable rates, and it is probably a better value than leasing. You probably don’t know what you’re doing, and you don’t want to mess up your brand new electrical devices or your roof with an installation error. The precious (~25 year) warranty on all your solar components is probably only valid if they are mounted by a certified installer. The process of getting all the necessary approvals and inspections seems like a bureaucratic nightmare that most people won’t want to go through. In the end, your life will be a lot easier if you let the professionals handle everything. 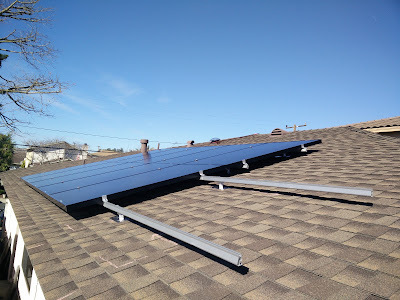 If you find a very accommodating installer, you might be able to save money by purchasing the panels from out-of-state (saving on sales tax) and doing some of the work, but I doubt most installers will tolerate that. When it comes to installers, I recommend you choose very carefully. For us, that meant finding the “Goldilocks” installer who was just right for us. We got quotes from quite a few companies, and were happiest with a mid-sized company. The big companies like SolarCity were completely inflexible with the system design and wouldn’t do the small customizations I wanted, and the smallest companies felt like they could go out of business any day, leaving us in the lurch with any warranty issues, so the mid-sized company was the best bet. The company we used was LA Solar Group whom I highly recommend. They have a referral program, so let me know if you are interested in solar and we can both get $500. It might be a little unintuitive to some, but the more electricity you use, and the bigger your solar installation, the better the investment. There are two main explanations for this. If you use lots of electricity, your utility will place you in higher pricing “tiers” and your electricity will cost more per kilowatt hour. Solar production will offset the highest cost electricity first, which saves a lot more than if you were in the lower tiers. For most residential systems, the cost of a going solar has a non-linear relationship to its electrical output. This is because there are many costs (like installation and the inverter) that are basically fixed regardless of system size. The panels themselves represent the variable cost, and panels are relatively cheap. Check out the table below, based on our system cost, to see what I mean. It shows how a 50% increase in system output only increases the price by 18%. This tip is a little technical and will only apply to some people, but it could be very helpful. 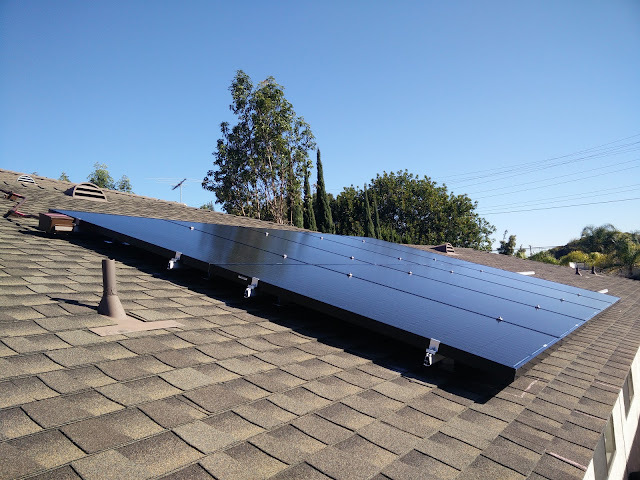 Our utility, Southern California Edison (SCE), requires approval for all solar installations. One of their requirements is that the system installed doesn’t produce way more electricity that will be used. That means allowable system size is determined by past usage. That was a problem for us because we expected our electricity usage to increase when our baby was born and Chrissy quit her job and spent more time at home. The only wiggle room allowed by Edison was that you can increase your system size by 10% without having to go through the whole approval process again. That became a big driver for our design. The target output for our system was a relatively small 2700 Watts (2.75 kW). The installer’s original design was to use eight 330 W panels. The problem with that was if we wanted to increase the size of our system by the allowable 10%, we couldn’t install another identical panel. Another 330 W panel would be a 12.5% increase, so that was a no-go. I asked my installers to design a system with 10 lower power panels so that adding one more identical panel would increase output by exactly 10%. They came through and made a design using 10 panels, each producing 275 W. That means we now have the option to easily upgrade our system if our usage ever does increase. Best of all, the cost of the 10-panel system was basically the same as the eight-panel design because the lower power panels were less expensive. When we were designing our solar system, it was determined our main electrical panel was on the borderline of being able to handle the load. We were told if we wanted to add any electrical load in the future, we would need to upgrade the panel then. However, if we upgraded our panel in conjunction with the solar installation, we could recoup 30% of the cost because it would be included with the federal tax rebate for the solar installation. That made it pretty clear we should go ahead and upgrade now. 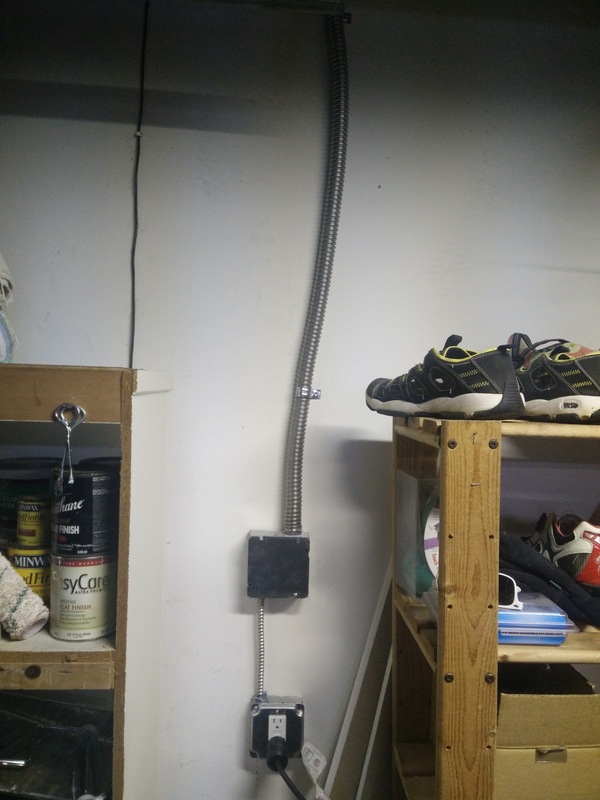 Since the electrician was already going to be at the house to upgrade the panel, we also had him install high voltage wiring to the garage for future electric vehicle charging. 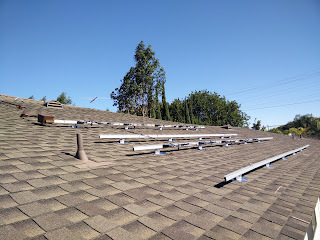 This wasn’t really related to the solar installation, but it was included on the same bill, so we will save 30% on that work too. I’m not really sure that’s “legal,” but I don’t really feel bad about it. They added more supports after this picture was taken. 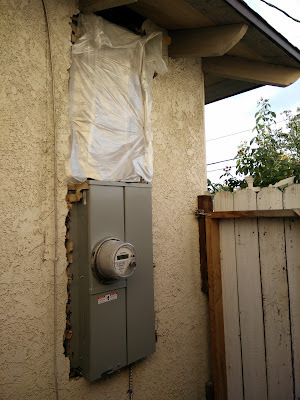 As discussed above, we wanted the ability to easily add an additional panel to our solar installation in the future. We were allowed to do that from a regulatory perspective, but I wanted to make the physical installation as easy as possible too. In order to accomplish that, I asked the installer to go ahead and install the railing that would hold that panel while they were doing the initial installation. This cost basically nothing and it makes adding another panel super easy. 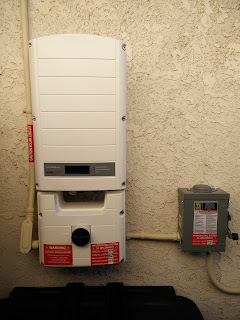 One of the biggest choices you need to make when installing a PV system is what kind of inverter** you want to use (if you want more details on inverters, read the footnote). I will keep this simple and tell you I recommend the power optimizer inverter setup made by SolarEdge. I also recommend you get a larger inverter than you think you need. That will make it easier to add capacity to your system if you ever want to in the future, and the cost is ridiculously small. For example, it only cost us $17 to upgrade from a 3000 W inverter to a 3800 W inverter. Our roof, from space. Lots of room for more panels. When I was first thinking about installing solar, I secretly wanted to install a huge system and sell a ton of electricity back to the grid. We have a very large south-facing roof that could fit a system far larger than we would need. SCE’s rules about system size, discussed above. The economics didn’t work out because Edison only pays the wholesale rate for any excess electricity produced, which is about a quarter of what they charge residential customers. Between the time I initially started researching solar and when our system was installed Edison increased their “interconnection fee” from ~$2/month to ~$10/month. This is a fee we pay just to be connected to the grid, even if we don’t use any electricity. The ridiculous 500% increase came as quite a shock on our first post-solar bill and made a significant difference in our payback period, so make sure you pay attention to any changes your utility makes to their policies involving solar. You may not be aware of this, but your electric utility company probably offers multiple rate schedules you can choose from. You most likely use the standard residential flat-rate plan with multiple usage-based tiers. If you install solar, you will probably be asked if you would like to switch to a time-of-use (TOU) plan, which charges different rates for electricity based on the time of day it is used. Electricity is most expensive during “on-peak” hours, which include the afternoon and early evening, and cheaper during “off-peak” and “super off-peak” hours. For us, the TOU plan offered by Edison didn’t make sense because the on-peak rate is ridiculously high and the off-peak rates are barely cheaper than the standard plan. Basically, make sure you do your homework before deciding to switch your rate plan. In the end, everyone needs to decide if solar is right for them and how involved they want to be in the process. 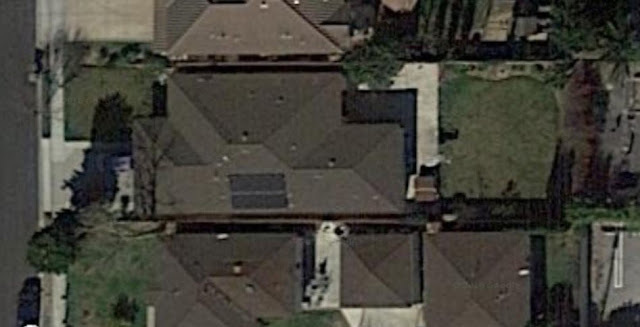 I think installing solar panels is a worthwhile investment and strongly recommend it for property owners. Do you have solar panels? What has your experience been? Let us know in the comments. *In hindsight, this wasn’t the smartest financial move. We decided to install solar right before my revelation that we could “retire” extremely early and that we would probably need to move to do so. However, most sources indicate solar panels increase a home’s value by 80% of the cost of the system, so it isn’t a total loss. **Inverters are pieces of equipment that convert the DC current produced by the PV panels to AC current used in your home and on the grid. The three basic types of inverter are micro inverters, central, “string” inverters, and power optimizer inverters. Micro inverters are small devices typically installed on the back of each panel. String inverters are larger centralized units that convert the current from all the panels in a system. Power optimizer inverters are kind of a combination of both. The main benefits of each inverter type are that micro inverters offer the most flexibility and a long warranty, string inverters tend to be less expensive and slightly more efficient, and power optimizer inverters basically combine the best elements of both types. One of the most important steps to becoming Fiscally Free is to track your expenses. Personal Capital makes that super fast, secure, and, best of all, FREE. Personal Capital is much more than an expense tracker. It has a number of advanced tools to track and analyze your investments and your net worth. I highly recommend you try Personal Capital today. You'll be glad you did.